Genocide: The destruction of a distinct people by acts of violence or demographic displacement, e.g. immigration-driven genocide. Legal oppression: The implementation of laws designed to harass, fine, and jail the defenders of a people; passing laws against free speech to silence those speaking out in defence of their people, e.g. legally perverse so-called “vilification” laws. 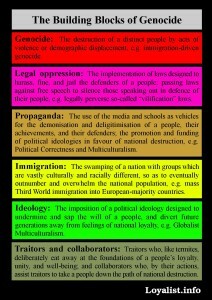 Propaganda: The use of the media and schools as vehicles for the demonisation and deligitimisation of a people, their achievements, and their defenders; the promotion and funding of political ideologies in favour of national destruction, e.g. Political Correctness and Multiculturalism. 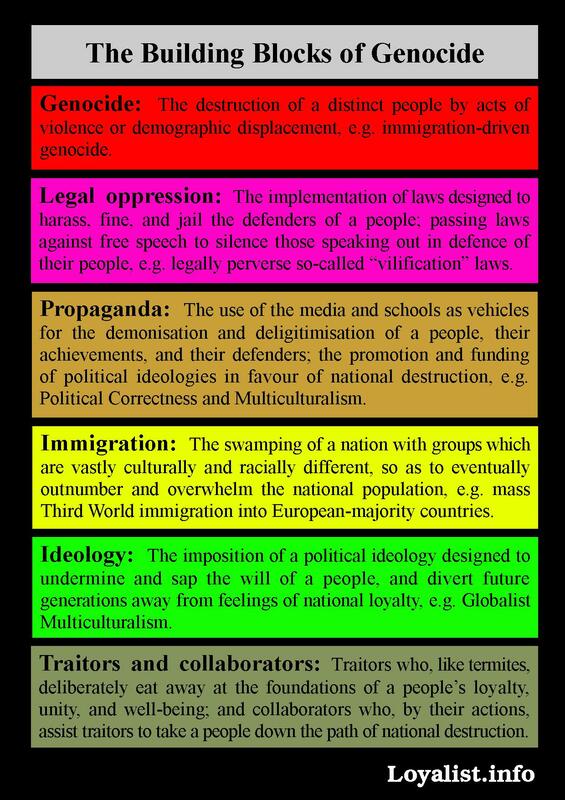 Immigration: The swamping of a nation with groups which are vastly culturally and racially different, so as to eventually outnumber and overwhelm the national population, e.g. mass Third World immigration into European-majority countries. Ideology: The imposition of a political ideology designed to undermine and sap the will of a people, and divert future generations away from feelings of national loyalty, e.g. Globalist Multiculturalism. Traitors and collaborators: Traitors who, like termites, deliberately eat away at the foundations of a people’s loyalty, unity, and well-being; and collaborators who, by their actions, assist traitors to take a people down the path of national destruction.